We offer repair and installation services for commercial aluminum doors in Atlanta, GA and the surrounding metro area. To learn more about repairs or installs, please call us at 678-714-7393, or contact us online. We also offer services for other commercial doors and openers. We repair all types of aluminum overhead doors found in a variety of commercial settings. 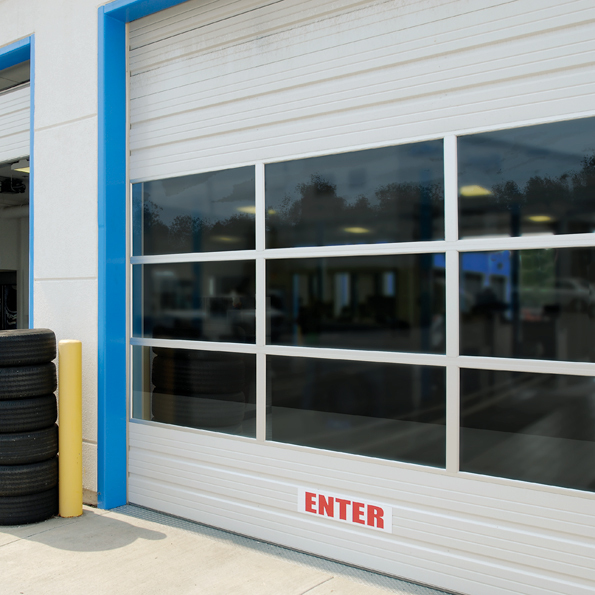 Many service bays are equipped with an aluminum door like the one above, and we understand that you need them operating safely and reliably in order to do business. Same day service is available in many cases. We warranty all of our work, and offer competitive prices on all of our repairs and installs. Whether you need an existing aluminum door replaced, or are just trying to decide if it’s a product that might work for you, we can help. Our installations are always covered by a labor warranty from us, and we use professional products from well known brands that also warranty their products. Many different options like glass, insulation and color choices are available in multiple price levels. Contact us for more information about having an aluminum overhead door installed.